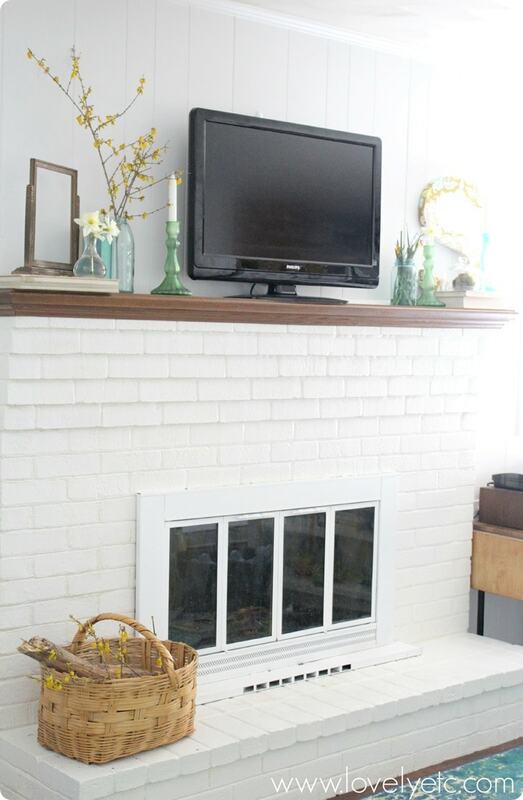 How to paint a brick fireplace (the right way) - Lovely Etc. Every now and then I get a wild idea about my house. I used to just brush them off, but then one day I got brave and started actually making them happen. And those crazy ideas have turned into some of my absolute favorite parts of my home. 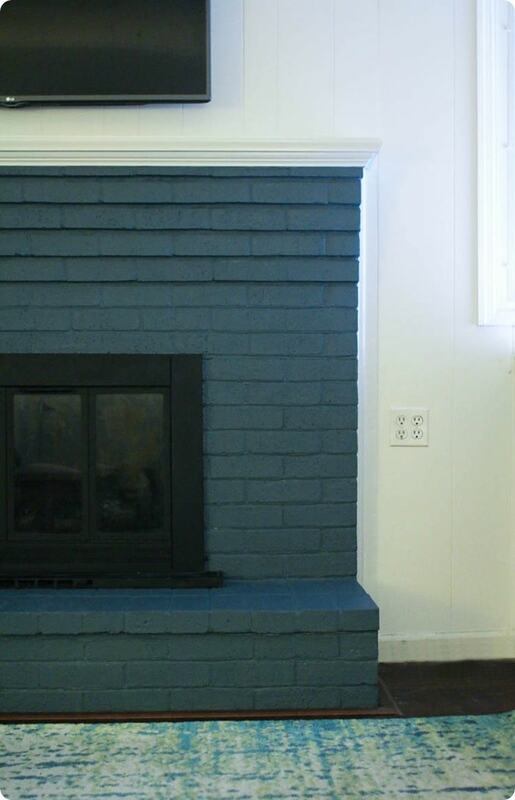 This spring I got a wild idea to paint my fireplace navy. 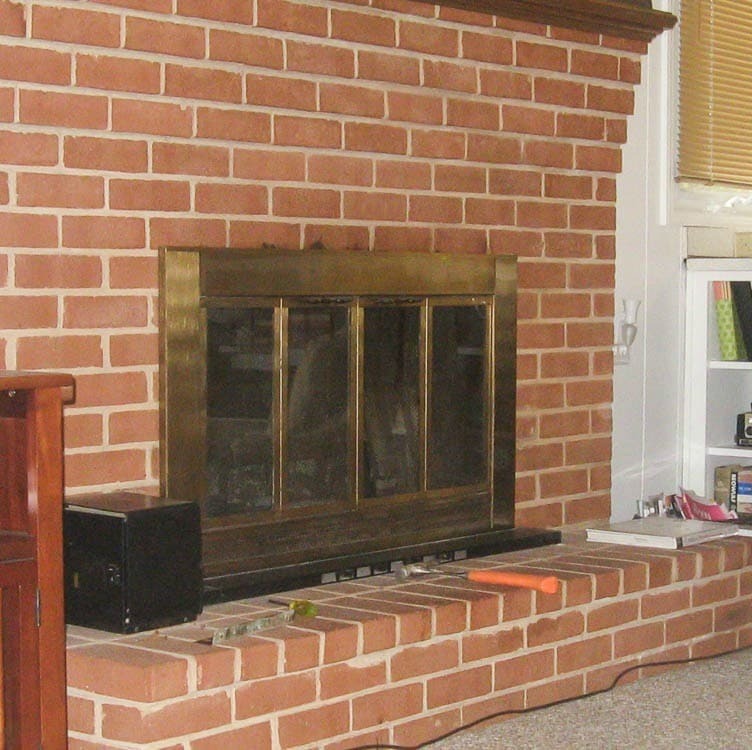 Our fireplace is a particularly unspectacular brick. When we moved in, it was unpainted red brick and I hated it. I’m not a huge fan of red brick to begin with, and our fireplace was especially bad because some of the mortar lines were incredibly sloppy. So I felt no qualms about painting it white pretty soon after we moved in. The white was a huge improvement. Huge. But it was just so boring. Now unfortunately, due to laziness, distractibility, and procrastination it took me about five months and two different kinds of paint to finish painting this fireplace. On the bright side, I did learn something important completely by accident. I started by painting the fireplace using chalk paint and it looked amazing. But I got distracted and didn’t seal it right away. And my son drove his little cars all over the hearth and the paint got all scratched up. In an effort to save myself some time (big mistake), I repainted it using satin latex paint in a color that exactly matched the chalk paint color. And when I finished, it really didn’t look great anymore. It doesn’t completely translate in photos, but the photo below gives an idea. The more shiny half on the right is painted with the latex paint. The shinier side just doesn’t look good. I’m not even really sure how to describe it, but all my attention was drawn to the actual paint on the shiny side. Not the fireplace, the paint itself. I know that sounds crazy, but there was a huge difference between the two. Important lesson learned and in the future I will only use matte paint on brick, even if I am just painting with boring old white paint. Since I would not recommend anyone else use the five month long, overly complicated approach I used, here is the method and paint I do recommend. Before you can paint anything, it has to be clean. I just wiped my fireplace down with a wet rag. You might also want to use painters tape to tape off any trim or flooring touching the brick. Painting brick is a bit of a pain, but it isn’t difficult. Because brick is so rough, you really have to push the paint down into all of the grooves. Also, if you are painting brick that has never been painted before, you should know brick is very porous and soaks up a lot of paint. Be prepared to paint several coats of paint. Even though you do not need to use primer with chalky finish paint, you may want to brush on a coat of primer before painting anyway. This will cut down on the coats of paint you need and save a little money since primer is cheaper than paint. If your brick has been previously painted, skip the primer. As I mentioned I mixed my own color using one part Legacy to two parts Relic. I love this color – it is a really great dark blue. Kind of a marriage between navy blue and charcoal gray. Start painting by using your paintbrush to push paint down into all of the mortar lines between the bricks. Then just go back with your brush and paint the faces of the bricks. In most cases, two coats of paint should be plenty for good coverage. Once the paint dries, it is time to seal it to protect everything. (Believe me, don’t skip this step!) Just use a foam paintbrush to paint the ultra-matte varnish over everything. I’m a big fan of using this sealer because it’s a lot easier to deal with than wax, but it doesn’t mess with the great matte finish of chalk paints. I’ve never seen a navy fireplace before, but I totally love it. I’m so glad I didn’t chicken out and stick with a safe color again. Now that I have finally finished the most drawn out paint job ever, I’m excited to finally decorate that mantel! I would love to build a frame for the TV so it isn’t quite so in-your-face, but in the meantime I’m going to go the much quicker route of drawing your eye away from it with cute décor. Great color that goes with your area rug, which I am crushing on. Thank you Teri! I love that rug! Why do boring (white) when there is navy paint available? I love how your fireplace looks now. I noticed your rug, too. Great look. Exactly! I love it too – and I definitely kept the rug in mind when I was choosing the color. I think they look great together! I am NOT a fan of blue anything to tell you the truth – BUT – I LOVE this flireplace!! What a GREAT job!! Yummy! Good job and I’m glad you listened to your gut instinct. Thanks Linda! I am so glad I listened to my gut too – I had no idea how it would turn out but I love it! 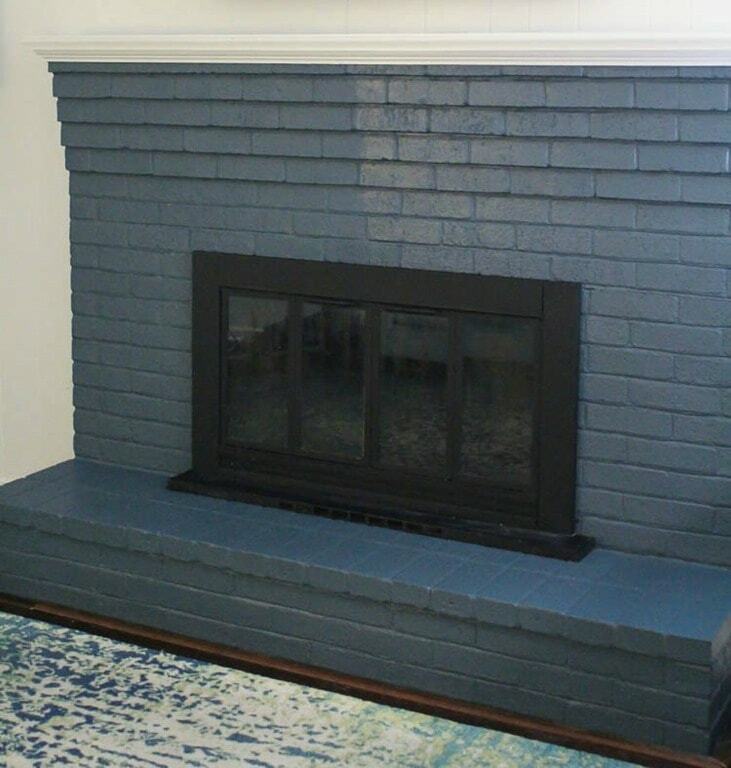 I never thought navy would be a suitable color for a fireplace until I saw your! It mixs really well with the wall color. I’m thinking about repaint my fireplace right now :) . You’re doing an amazing job, keep it up! Thanks so much Jennifer! I never thought navy would work so well on a fireplace either but I am loving it! I’m looking for more materials and going to decor the fireplace with my kids this weekend! Thank you so much for sharing, Carrie. My husband and I recently bought a home with a brick fireplace, and we would love to be able to update it somehow. 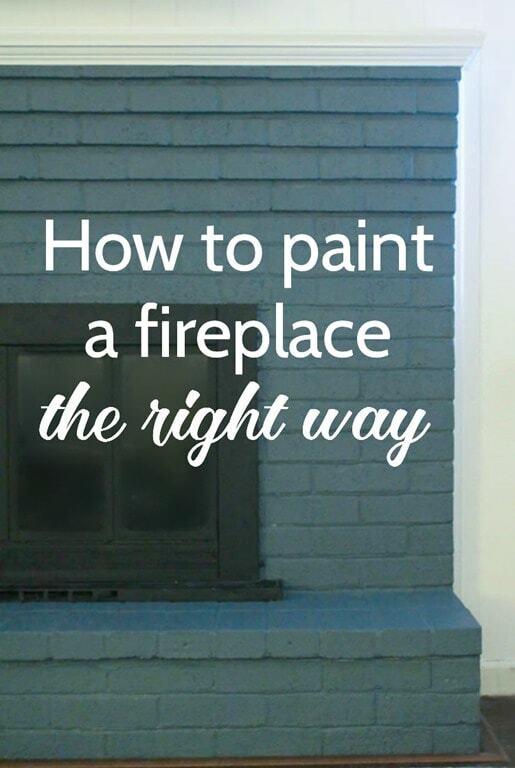 Painting the fireplace seems like a fun idea to bring some life back into it. Thanks for the warning that brick is porous! That’s a great idea to put some primer on it first so it isn’t so porous! Thanks for the tips! No problem! Good luck with your fireplace! 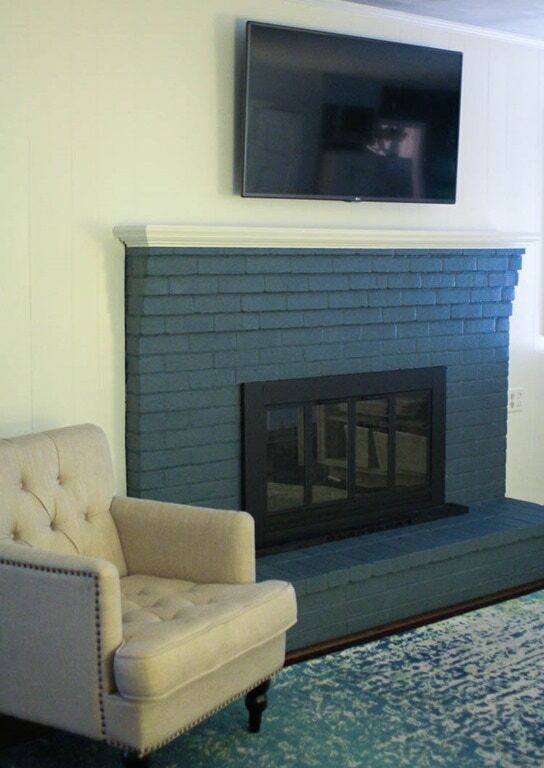 I’ve been wanting to pain my brick fireplace place ever since I saw it on Fixer Upper. Now that I’m ready to do it I’ve been searching How-to’s…the easy process. After an hour of clicking here and there and watching videos I found this page. I want a pretty dark blue, which you have done. It’s an easy process, double check. And the cherry on the cake….we share the same name!! It was meant to be!! Yes, definitely meant to be! I’m still loving my blue fireplace! Good luck.